Previously presented exercises are the most important ones for lower back pain. But why and how are they so effective? On one side it warms up the muscles and joints pumping fresh blood and oxygen to the low back area. 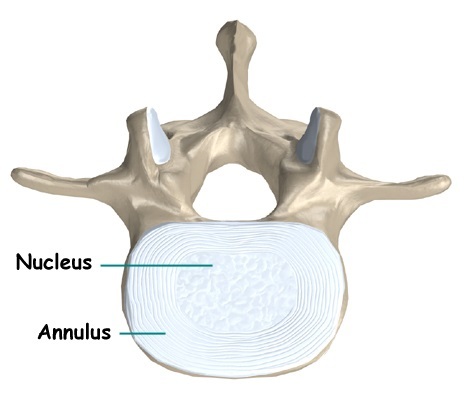 But its main benefit is the effect to the intervertebral discs. Let’s learn some anatomy for it. There are two parts of a discus: an outer, fibrous ring (annulus fibrosus) and an inner jelly-like central portion (nucleus pulposus) witch is capable of holding a large amount of water. A fully filled healty disc gives the optimal distance betwen two vetrebrae. Due to several conditions, like aging and chairborne lifestyle in the first place, this central material starts losing water and its volume decreases. Same thing happens when the tire of a car goes flat, the sides begin to bulge. It creates a sensitive, instabil feeling in the lower back witch makes the paravertebral mucles overtoned to maintain balance. And this is how a long lasting lower back pain story starts. And here comes the dog-cat-rabbit exercise on the scene. The good news is that that we can pump up the discus with fluid by diffusion which the inner jelly-like material can store. Imagine a sponge squeezed in your hand. If you put it in water and release it, it will absorbe as much liquid as it can. With this exercise the ring of the discus works in the same way. In the dog position the dorsal side of the ring is pushed and will open while moving into cat position. This action enables the liquid to diffuse from surronding tissues. Now the abdomen side of the ring is under pressure. An other drop can diffuse inside when you continue to rabbit posture. Right here the low back part of the spine is streched well, which moves the discus into the centre. And as you continue with it, it feels like shaking up a pillow filled with feathers. The discus is getting bigger and the bulging can withdraw. Of course just a small amount of moisture can get through at each movement. It means that should repeat the whole series (20 dog-cat-rabbit and 2 spine twistings) at least once a day but my recommendation is 3 times 3 series per day if you are „motivated”. You can also practise it when you feel down due to strong lower back pain. This time apply small, imitated movements! No pressure!